There are those who feel that criticising Shakespeare is the theatrical equivalent of apostasy, and to accept just one flaw is to admit the existence of a crack that could fatally undermine his genius. Yet while zealots shout heresy, it cannot be denied that Shakespeare wrote a lot of plays and that not all are masterpieces. Each century has its favourites but time seems to have led to the emergence of an A-list and B-list; in the modern age whither have gone Pericles, King John or Henry VI Parts I, II and III? But there are problems even among his more popular outings; I would argue that Henry V is a second-rate play enlivened only by Shakespeare’s ability for heart-swelling, grandiose speeches (indeed it is hard to even write the sentence without wanting to refer to how he can ‘stiffen the sinews [and] summon up the blood’). Equally if I could go through life without experiencing the entire post-interval acts from Romeo & Juliet then I would be all the happier for it. Yet The Tempest has always proved a more challenging option. It is held up as the scholarly choice for greatest Shakespeare play. The temptation for academic insight is too much to bear. It is his last solo play, his farewell to the stage. Prospero can easily be seen as Shakespeare writing himself into the story. As he waves goodbye to the mysterious magical island, his powers fading, how can it not be seen in this light? This dry academic interest inevitably strips much of the fun out of the play. 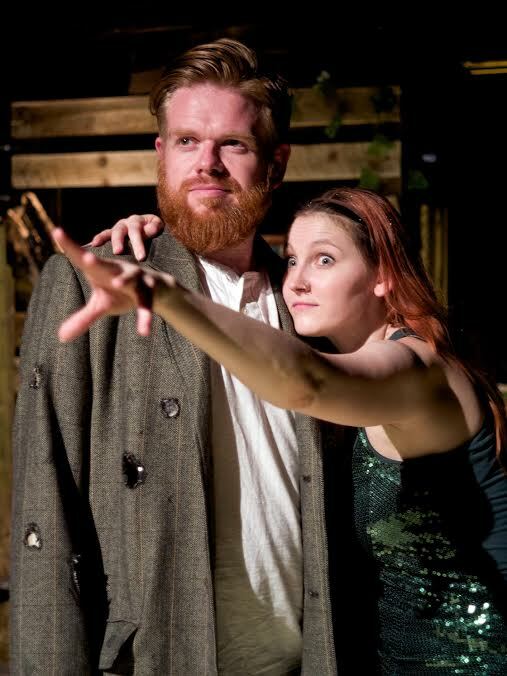 The Tempest has magic and monsters, comedy and romance. It starts with a shipwreck and teeters towards tragedy. At the very least it should be entertaining. However too many productions get wrapped up in Prospero and it becomes little more than an opportunity for an actor to wrestle with Shakespeare’s last great part, and get under the skin of the man himself (and if that is the aim then I recommend any actor look no further than the challenge of Edward Bond’s Bingo if they want to take on Shakespeare directly). 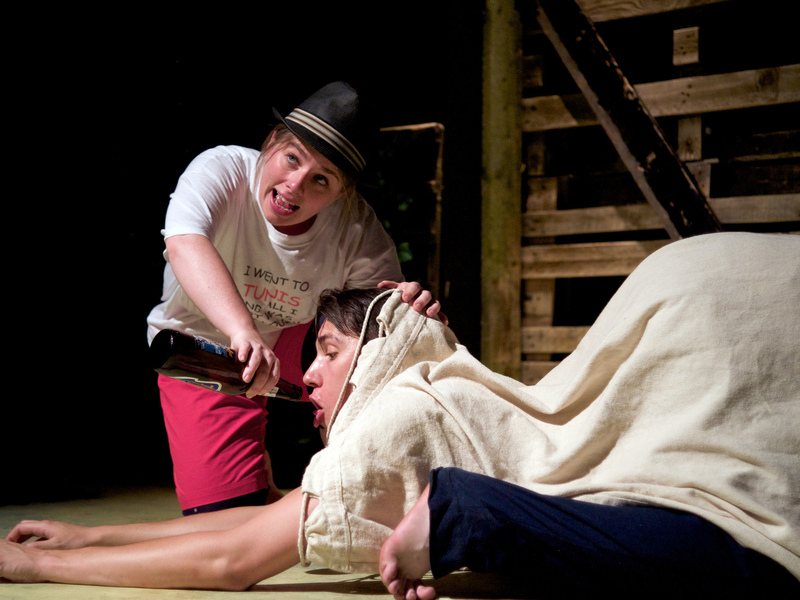 Cheek By Jowl’s Russian company produced a superb version in 2011, and they did so through an inventiveness and an absurd but near malicious humour that sits easily with Prospero’s casual cruelty towards Caliban and recognition of Ariel being not far removed from the trickster sprite of Robin Goodfellow. If this production falls short in comparison it is because Cheek By Jowl have spent 20 years building a reputation worthy of generating international acclaim. However Thick of Thieves can be applauded for approaching a challenging play with spirited energy and an appealing ingenuity that makes best use of the limited resources offered by a small black-box space. They have set out to entertain rather than inform, and if I left having learnt little I didn’t already know then I must also admit to leaving having not enjoyed Shakespeare this much for quite some time. The Tempest is one of the shorter plays, but Thick of Thieves strips it back to a trim 90-min and run it without an interval. Having experienced the best and worst of judicious cutting of the bard over the last year, I feel the production is not compromised by the textual revisions. Inevitability there are moments when the plot skips along a little too quickly but any loss of clarity lies, not with the editing, but with the sense of urgency that propels the action as it can overwhelm the necessary diction at times. However one could never level the accusation that the evening becomes ponderous. And what may at times be lost is never more than what is gained through the commitment of the cast to the production. Casting just 4 actors to cover 11 roles, and choosing to stage a play that involves a shipwreck and magic in a room above a pub, requires ambition and belief. The actors must believe that the production can work, and they must transmit this wholehearted assuredness to the audience so that we can believe. This production both magnified and revels in the naked falsity of the stage. The action is on stage and around us. The idea that we are transported to a magical island is at once nonsensical and entirely true. How else but on a magic island could a room contain a shipwreck? Who else but a magician could become three parts (Marcus Holden as Prospero, Sebastian and Trinculo)? The production shows the advantage of removing an interval. The Tempest is a magical play and the spell should not be broken until lights fade at the end. To be forced out of the auditorium halfway through in order to fight the queue at the bar for an overpriced glass of wine is a surefire way to dispel the illusion of theatre. Equally the cast must remain committed throughout, and that is real strength here because even when transitions are slightly clunky, or lines become swallowed, it is tackled with such conviction and trust that the audience is willing to embrace the magic that is cast around them..
Just as not every idea is a good idea, not everything in this production entirely works. Yet to ask the director, Nicky Diss, to dial it down seems as cruel as Prospero’s repeated promise to release Ariel from entrapment. Diss seems to be a similar free spirit, for whom theatre is a playground where bumps and scrapes are an integral part of the learning process. Thick of Thieves production of The Tempest may not be the best Shakespeare production I’ll see this summer, and it certainly won’t be the polished, but perhaps it will be the one that leaves me in the highest spirits and most optimistic for the future.